No Downtime – Can be performed during your lunch hour! What is Botox® or Dysport Cosmetic? Botox® has been used therapeutically for over 16 years to treat a variety of medical conditions. It is approved in more than 75 countries and remains the most studied botulinum toxin and one of the most widely researched medicines in the world. 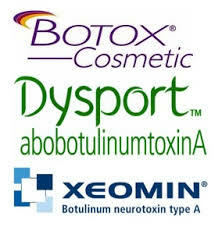 Botox® was approved by the United States Food and Drug Administration in 2002 as a cosmetic treatment. Botox® is a purified protein administered in a simple, non-surgical procedure that temporarily improves the appearance of moderate to severe frown lines between the brows, frown lines near the lips, crows feet and forehead lines in people age 18 to 65. During treatment, very low doses of Botox® Cosmetic are administered via a few tiny injections directly into the muscles that cause those stubborn lines between the brows. A recent survey reported that most patients were satisfied with the results of the Botox® Cosmetic Treatment. This survey was conducted in 2005 by the Aesthetic Surgery Education and Research Foundation. You can expect to see results within days after your treatment. The appearance of the area between your brows, lines on the forehead and frown lines may continue to improve for up to a week. By day 30 in a clinical study, 89% of patients judged the severity of unwanted lines as moderate or better. How Do I know If Botox® Cosmetic Treatment Is Right For Me? If you are between the ages of 18 and 65, you may be a candidate for Botox® Cosmetic. But first, you must consult with your doctor to see if a treatment may be right for you. Laser Creations has a licensed clinical physician on staff that can assist you in your decision.